We will be releasing the latest in the Inherited Oak series, Inherited Oak Blueberry Maple in the taproom! Join us, alongside Cerebral, Outer Range, and WeldWorks at Fresh Craft! An evening at The Boiler Room’s new speakeasy, with Stem Ciders. A new imperial version of Bout Damn Time, to be released March 29, 2019 in the taproom only. Join us at the Colorado Keg House for the 2nd annual Celebration of Women in Brewing, benefiting SafeHouse Denver! Join us for an hour long yoga session hosted in our taproom! The latest in the Whimsy series makes it’s taproom return! Beer and Denim on Denim…need we say more? Oh yeah, WINTER WONDERGRASS. Zwicky P, our zwickel pilsner, available on our firkin system Friday, February 15th! A TAPROOM DOUBLE RELEASE FEATURING A NEW PILSNER AND A NEW SPELT IPA. Our newest lager, featuring German Hallertau Hops! A 4 course meal featuring our Head of Special Projects, Brandon Boldt! Tap Takeover in Nederland, Colorado. Inherited Oak Series: Balaton Cherry, a Barrel Aged Golden Sour, will be release on Friday, January 18th at noon in the 4 Noses taproom. One of our Beer Beers Events! A beer cocktail is a cocktail that is made by mixing beer with a distilled beverage or even another style of beer. Typically the primary ingredient is beer. The end goal is simply to mix some style of beer with other ingredients to produce a finished balanced drink just as we do with all of our handcrafted libations!! WHAT IS 4 NOSES BRINGING? 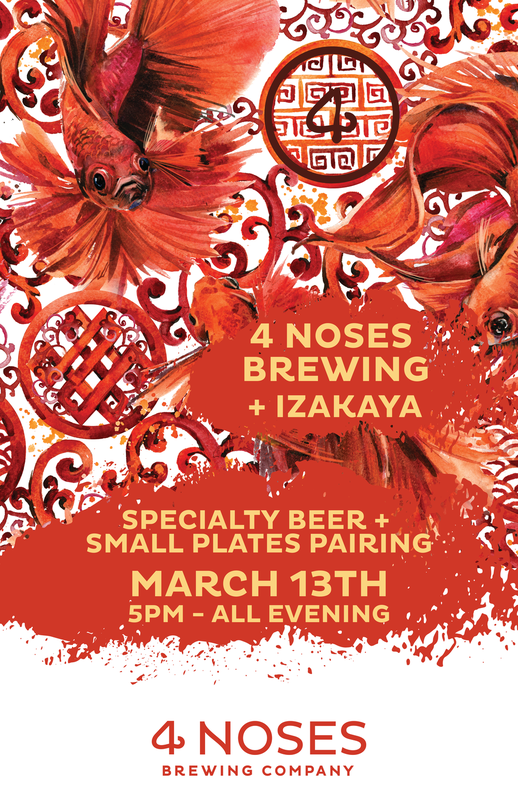 We will be featuring 3 special cocktails made with these 4 Noses taps and 3 Colorado distilleries, a 4 Noses flight as well as shot and beer specials all weekend in honor of the Big Beers, Belgians & Barleywine Festival! Brewmosa, our Brut IPA with Blood Orange, to hit the taproom December 28,2018. 4 Noses Brewing Company to release Full Transparency IPA on November 2, 2018. We’re hosting our 3rd Annual Doggy Costume Contest! 4 Noses Brewing Company to release El Jefe Imperial Stout and Rhuberry Velvet Milkshake IPA.